Vicki is the Clinical Director of the Crisis & Trauma Resource Institute, an Approved Supervisor with the American Association for Marriage and Family Therapy and an instructor in the graduate program for Marriage and Family Therapy at the University of Winnipeg. She is the editor and co-author of our Counseling Insights book. In her private practice, she specializes in the area of trauma recovery for individuals of all ages, and she helps individuals, couples, and families build positive mental health and relational skills across developmental stages. She believes in a holistic approach to wellness that applies to both clients and helpers. Vicki also believes that it is essential for helpers to continue learning and developing their self-awareness alongside evolving clinical skills. As a trainer, she is particularly gifted at creating a learning atmosphere that is collaborative and respectful, and which embraces diversity in personal identity, skills, and cultural perspectives. Trauma is prevalent in our world and has an impact on many of the people we interact with, including our clients and colleagues. Compassionate and trauma-informed care is essential to providing effective support and building sustainable services. 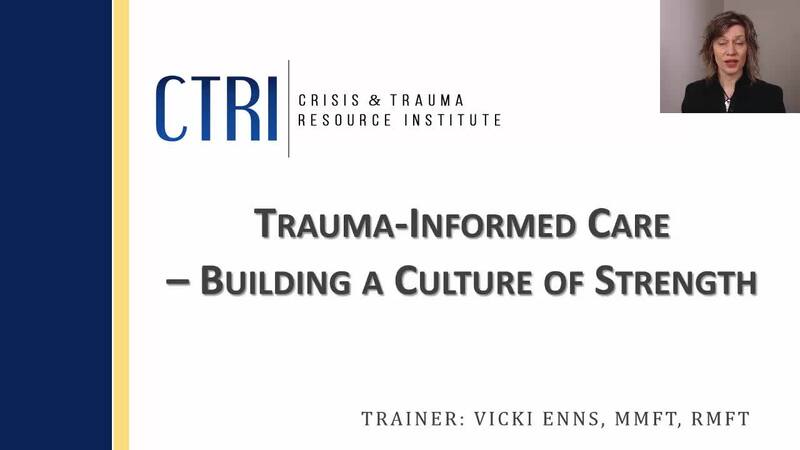 This webinar explores how to build a trauma-informed culture in a workplace setting that integrates knowledge throughout the organization. Guiding principles will be explored for increasing emotional and physical safety, culturally sensitive empowerment, and creating greater resilience for all parts of an organization.